Apple on Wednesday announced that it is bringing the cellular models of the iPad Air 2 and iPad mini 3 to China starting this week. The iPad models will be equipped to connect to all of China's 3G and 4G networks with support for TD-LTE and FDD-LTE standards, in addition to TD-SCDMA, DC-HSDPA, and HSPA+. Previously only the WiFi models were available in the Asian country. With the release of the iPad in China, the tablet device is now available in 110 countries worldwide. The new Chinese cellular models are available with a starting price of 4,488 (RMB) for the 16 GB iPad Air 2 and 3,788 (RMB) for the 16 GB iPad mini 3. Apple also reduced the price on older iPad models with new entry level prices of 2,888 (RMB) for the 16 GB iPad Air with WLAN model, 2,198 (RMB) for the 16 GB iPad mini 2 with WLAN model, and 1,798 (RMB) for the 16 GB iPad mini with WLAN model. BEIJING―December 11, 2014―Apple(R) today announced that models of iPad Air[TM] 2 and iPad mini[TM] 3 with cellular networking will be available in China starting this week. TD-LTE and FDD-LTE standards, as well as TD-SCDMA, DC-HSDPA, HSPA+ and other fast networks, are all available in a single model, giving iPad Air 2 customers in China the ability to stay connected on advanced cellular data networks in China and around the world so they can go more places and do more things. iPad Air 2 is the thinnest and most powerful iPad(R) ever. 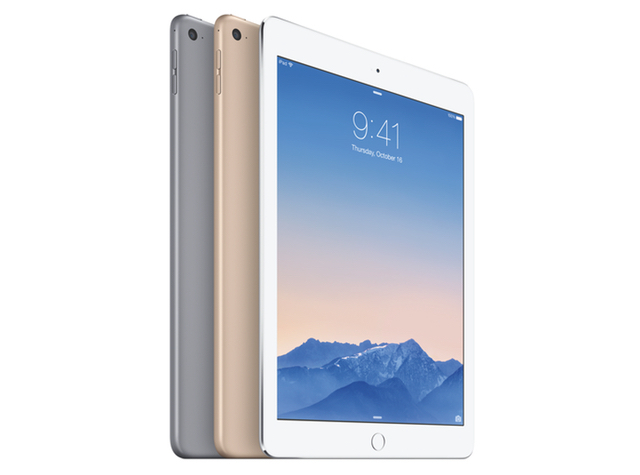 Just 6.1 mm thin and weighing less than a pound, iPad Air 2 is packed with amazing new innovations-an improved Retina(R) display with a new anti-reflective coating that reduces glare by 56 percent* for enhanced viewing in the office, the classroom or outdoors; all new iSight(R) and FaceTime(R) cameras for capturing stunning photos and videos; second generation 64-bit A8X chip that delivers improved CPU and graphics performance while playing games or working; and the revolutionary Touch ID[TM], a simple and secure way to unlock iPad with just the touch of a finger and authenticate within apps to better protect logins and data. Thin and light enough that you can comfortably hold it all day, iPad Air 2 still delivers the up to 10-hour battery life** users expect from iPad. iPad Air 2 with WLAN + Cellular delivers faster WLAN and FDD-LTE for up to 50 percent faster cellular connections*** so users can easily get and stay connected wherever they go. The new iPad mini 3 joins iPad Air 2 in offering users the simplicity and security of Touch ID; both run more than 675,000 apps specifically designed for iPad and come in three gorgeous metallic finishes-gold, silver and space gray. iPad Air 2 and iPad mini 3 are currently available in more than 110 countries worldwide including China, the US, Australia, Brazil, Canada, France, Germany, Japan, Russia, Singapore and the UK. iPad Air 2 with WLAN models are available in China for a suggested retail price of 3,588 (RMB) for the 16GB model, 4,288 (RMB) for the 64GB model and 4,988 (RMB) for the 128GB model. iPad Air 2 with WLAN + Cellular models which support both TD-LTE and FDD-LTE are available for a suggested retail price of 4,488 (RMB) for the 16GB model, 5,188 (RMB) for the 64GB model and 5,888 (RMB) for the 128GB model. iPad mini 3 with WLAN models are available for a suggested retail price of 2,888 (RMB) for the 16GB model, 3,588 (RMB) for the 64GB model and 4,288 (RMB) for the 128GB model. iPad mini 3 with WLAN + Cellular models which support TD-LTE and FDD-LTE are available for a suggested retail price of 3,788 (RMB) for the 16GB model, 4,488 (RMB) for the 64GB model and 5,188 (RMB) for the 128GB model. iPad Air, iPad mini 2 and iPad mini, available in silver or space gray, are now offered at more affordable prices. iPad Air starts at 2,888 (RMB) for the 16GB with WLAN model, iPad mini 2 starts at 2,198 (RMB) for the 16GB with WLAN model, and iPad mini starts at 1,798 (RMB) for the 16GB with WLAN model. iPad Air with WLAN models are available for a suggested retail price of 2,888 (RMB) for the 16GB model and 3,288 (RMB) for the 32GB model. iPad Air with WLAN + Cellular models which support both TD-LTE and FDD-LTE are available for a suggested retail price of 3,788 (RMB) for the 16GB model and 4,188 (RMB) for the 32GB model. iPad mini 2 with WLAN models are available for a suggested retail price of 2,198 (RMB) for the 16GB model and 2,588 (RMB) for the 32GB model. iPad mini 2 with WLAN + Cellular models which support both TD-LTE and FDD-LTE are available for a suggested retail price of 3,088 (RMB) for the 16GB model and 3,488 (RMB) for the 32GB model. Additionally, the original iPad mini is offered at 1,798 (RMB) for the 16GB WLAN model and 2,688 (RMB) for the 16GB WLAN + Cellular model. iPads are available through the Apple Online Store (www.apple.com), Apple's retail stores and select Apple Authorized Resellers. Apple announces imminent launch of iPad Air 2 and iPad mini 3 in China originally appeared on TUAW: Apple news, reviews and how-tos since 2004 on Thu, 11 Dec 2014 09:00:00 EST. Please see our terms for use of feeds.